Each of our graduates is also eligible to use our nationwide job placement assistance program. We own bartending schools in other states and also are affiliated with Professional Bartending Schools of America. 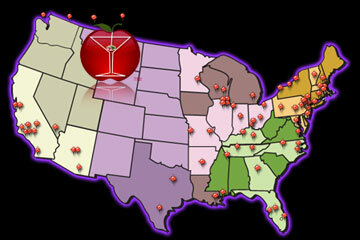 PBSA is the nation's largest group of independently-owned bartending schools with reciprocal placement services. We feel we have the best schools for placement in the industry. Any of our graduates may call the local bartending school that they graduated from and check to see if we have placement in the new city they are interested in. Once the student has relocated to the new city , our job placement director will call the new school for the student and set up their job placement appointment for them. The student then simply reports to the new campus and shows their PBSA diploma and all of the new cities job openings are available to them at no charge. The new school will treat the graduate like one of their own. The graduate may use job placement services at the new campus as often as they like. Our nationwide job placement program is a great way to see the country while earning a good living. Copyright 2019 Professional Bartending Schools of America LLC.